If you happen to be in Chicago this summer, please stop by Circle Contemporary and check out this show curated by Nina Wexelblatt. Elana Adler, Guy Conners, Lindsey Dorr-Niro, Óscar I. González Díaz, Thomas Kong, Alysha Kostelny, and Sara Ludy. To remember several things at once, turn each into an object and visualize arranging it carefully around an interior of your choosing. This is your memory palace. Anytime you need to recall an item, wander back through the palace. It should be right where you left it: information in a mental blueprint. But you might find that things congeal strangely in the set design of the mind. Coordinates warp and contract, matter changes properties, references dissolve. This exhibition presents subconscious architectures and objects at the edge of familiarity. Inverted, fragmented, or at an odd angle, these works free us to forget the slick surfaces of easy identification, utility, or commodification. Turned over like tumbled rocks, their woozy edges expose what’s underneath: from the interior décor of dreams to the pure forms hiding inside the scraps of consumer culture. The exhibition seeks to put into language the idea of the “millennial’”—in the truest sense of the word—extrapolating the terms used by artists and creative practitioners in relation to the internet, including the so-called post-internet phenomenon. Fittingly, the viewer is an active agent, engaging new forms of networked behavior and participating both in the gallery space and beyond, through additional digital works hosted online. I Was Raised on the Internetplays with the dystopic connotations of our online multiverse but also is a direct reaction to the utopic beginnings of the world of computing. Join us this Friday for a one night fundraiser and silent art auction to benefit relief and long term efforts in Mexico and Puerto Rico. The Chicago Artists Coalition has kindly donated their entire space for this event! There will be art, music, food, and libations donated by local and international artists, musicians and local businesses. 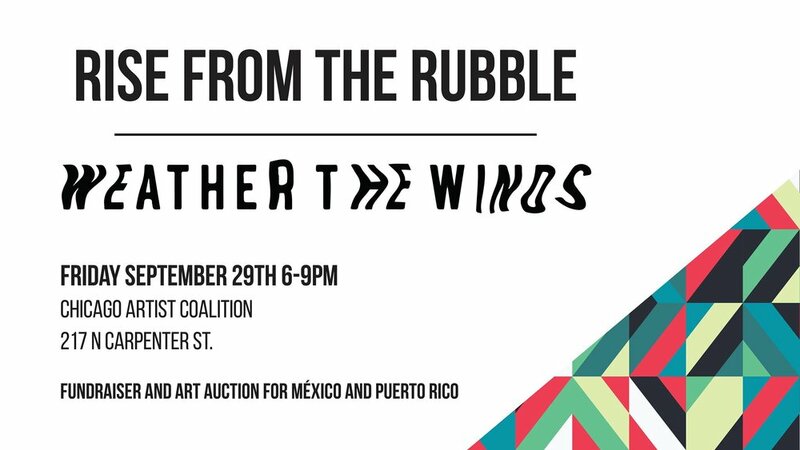 All proceedings will go to relief causes for the recent earthquakes in Mexico and hurricane in Puerto Rico, (specifics of the local grassroots organizations will be given the night of the auction). There are over 60 participating local and international artists! The silent auction will include installation, sculpture, works on paper and prints. Publications, artist books, custom clothing, and fine good will also be for auction. **Silent auction will close promptly at 9pm! Serving Buzzbox premium cocktails and beer provided by 5 Rabbit Cerveceria. Gracias, and we hope to see you all on Friday. A series of works around diasporas of exile is presented at this exhibition, bureaucratic systems of oppression and historical assimilation. I am pleased to announced I will be at EXPO this year. Please join me during the weekend of sept 13-17. do say hi if you see me or my work. Join us for the public opening reception of the 2017 MFA Show, a presentation of more than 100 MFA candidates’ new and ambitious work. Monday - Saturday, 11:00 a.m. - 6:00 p.m.
Students work for more than six months with three guest curators and 12 graduate curatorial fellows to envision the exhibition, an approach that allows for dialogue, process, and collaborative decision-making among the artists and curatorial teams. I have been graciously invited by Pia Singh to take part in a showcase of artists in response to the word citizen. I have presented a couple of studies from projects past that deal directly with the ideas of citizenship. Please take a look if you're in the area. Reception: Friday, September 23, 6:00–9:00 p.m.
New Work showcases projects by current MFA and BFA students as selected through portfolio reviews by the SAIC Exhibitions and Exhibition Studies Committee. This year’s exhibition is rooted in exploratory and critical modes of making and viewing. Featuring work by Da'Niro Elle Brown, Oscar Gonzalez-Diaz, Rosabel Kurth, Melissa Leandro, Luis Enrique Mejico, Lucia Novoa, and Zhiyuan Yang. Curated by Graduate Curatorial Assistants Alice Ashiwa (MAAH 2017) and Asha Veal Brisebois (MAAAP 2017).